(Natural News) There are estimations that eighty percent of disease begins in the mouth. This is not too hard to believe considering it is the most open orifice for various pollutants, most notably the highly processed and toxic food we ingest on a regular basis. 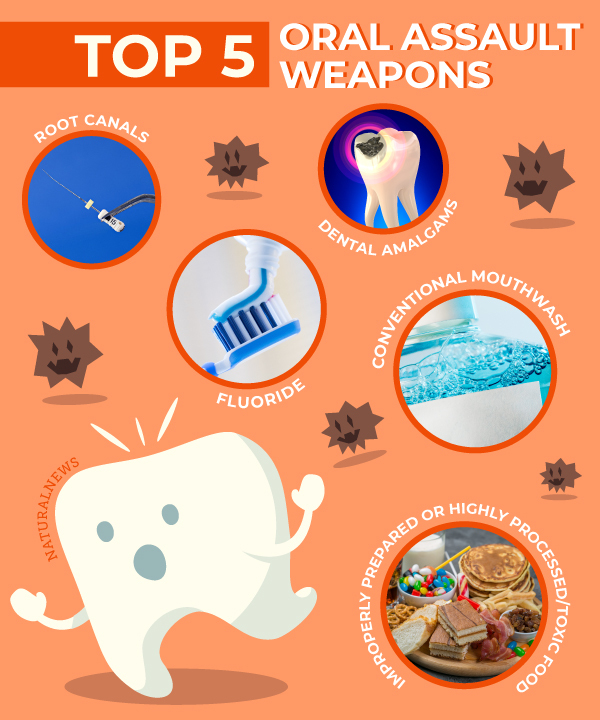 This food not only can introduce dangerous pathogens into our oral cavity but it can also ruin various areas of our digestive system, eventually resulting in poor assimilation, nutrient deficiencies, acidity, and poor bone and tooth health. 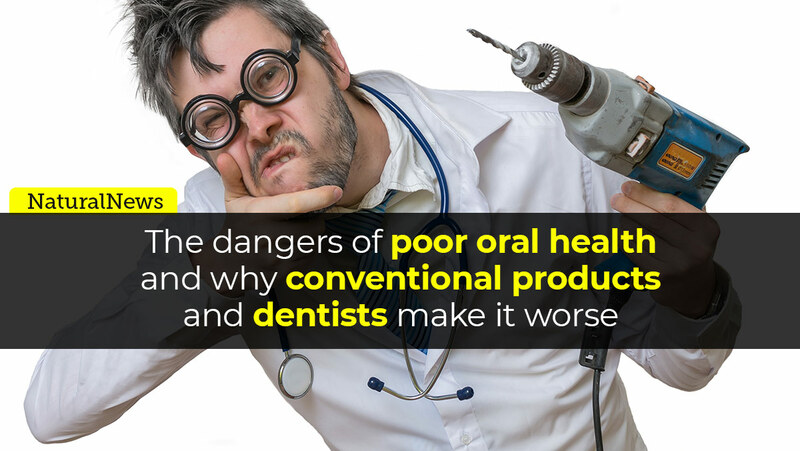 Of course, conventional wisdom suggests chemically laced toothpastes, mercury amalgams, and other dental procedures to repair this damage, when in reality, they leave your oral and general health in an even more precarious situation that leads to much more serious disease. It can all happen so quickly, but with some effort, you can avoid this dangerous path and even alleviate damage that is already done. You may think that the main damage is done when they are put in, and that may be true, but there are other processes most don’t consider that go on unabated as long as the fillings remain in the teeth. One is that these fillings can release mercury, tin, copper, and silver into the body and corrode into metallic ions that can migrate from the tooth to the root, the mouth, the bone, the connective tissues of the jaw, and finally into the central nervous system. These ions can permanently reside there disrupting proper body functioning if they are not removed. “Teeth are similar to other organ systems in the body in that they require a blood supply, lymphatic and venous drainage, and nervous innervations. Root canals, however, are dead teeth, and they can become one of the worst sources of chronic bacterial toxicity in your body. Anaerobic bacteria that do not require oxygen to survive live in these side canals and release toxins that cause chronic infection. The blood supply and lymphatics that surround these teeth drain this toxicity and allow it to spread through the entire body. Of course, the dangers of fluoride have also been well-stated over the years, and you can read all about the truth on fluoride and the effects it has on the body at Fluoride.news. Just remember it’s a mainstay in conventional toothpastes, many public water supplies, and dental cleanings. These ingredients are as hard on your oral and overall health, as some of them are to pronounce. If you want to learn more of the dirty details on these ingredients, check out this article. So, what’s a person to do to avoid this vortex of oral assaults? First of all, if you still have dental amalgams and old root canals, please find a holistic dentist and have them removed and repaired, respectively. Then take a more unconventional approach to your teeth to heal any other damage done to your teeth and oral health. You can find a holistic dentist and learn how to care for you teeth naturally going forward, with An Unconventional Approach To Dental Health That Works. An extremely easy way to clean up your medicine cabinet and your oral health on your own is through the Health Ranger’s Ultimate Dental Essentials Kits + Silver Breath Spray, which will provide you with a brushing, oil pulling, and mouth freshener solution all in one. You can check out that kit, here. Once you are able to incorporate these solutions, you’ll find your health will inevitably improve, as you won’t be leaking toxic metals and bacteria into your body which is the perfect storm for further destruction in the entire body later. That alone, is a reason to smile.